Good morning sunshine! Here is a healthy breakfast/snack idea for you. This morning I made a veggie & fruit smoothie which tastes amazing. If you're not so into eating greens, this is a perfect way to incorporate some into your diet without even tasting it. 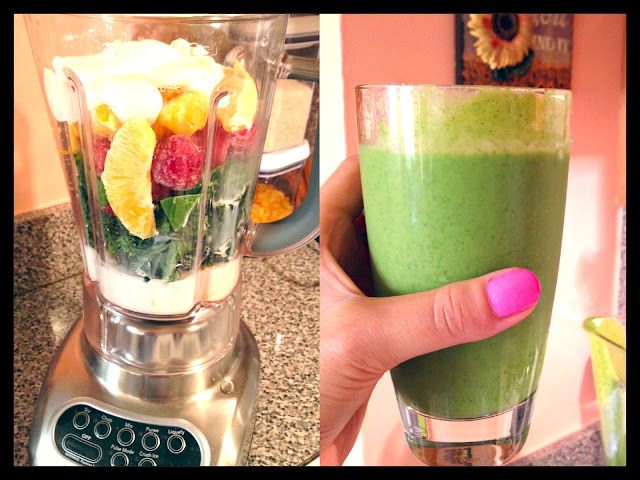 The smoothie mix you see below makes two large full glasses, (and you can always save half of it for the next day!). It's the first time that I comment but I read your blog for a few months. My English is not the best because I'm from Portugal. But wanted to try. I really like your videos and your tips because it seems you give all from your heart. I've been getting more in touch with my healthy side lately :) And have been exploring different ideas to get in all the nutrients I need and shakes/smoothies have been great! I find that I can get bored quickly and veer of course, but there are so many different ways to make a smoothie or shake! This morning, I made a shake with kale, banana, strawberries, chocolate protein powder,fibre powder, and some almond milk - so good! I'm going to try this, Thank You! I need to try your smoothies but first i have to buy a new mixer! I LOVE your healthy food posts! You should do them more often! YUM! <3 oh and Thanks for the recipe! I love it! I'm committing to living healthier life. ..Keep these coming, i will definitely be trying this out! i simply get soo excited whenever you blog about hralthy meals or snacks!! I always want to try what you post about. so inspiring. Thank you Annie! These are my favorite kind of posts! Wow Ive never tried this but I definetely will, it looks soo yummy! You really inspire me to be healthier. love the healthy food post please keep them coming chicky!! Im having this smoothie right now. It is soooo yummyyy. Thanks ANnie! hi Annie, this looks so yummy. my only advice/ concern is it's best to drink this within the first two hrs of making for the nutrients in it is pretty much worthless after. if you must store in the refrigerator make sure its in a dark container. Same for juicing...when I came across your you tube channel and also subscribed to liferegenetore i did my research on juicing and was so inspired to add it into my life style. Thanks for your advices, keep doing what you do!! The color is beautiful. thanks for sharing with us. I try to have smoothies in the mornings too, but I usually don't add veggies. Thanks for the idea :) I also add in ground flax seed with mine, keeps me really full! I love your healthy food posts! Thank you for introducing me to Dan the Man. I have been watching him quite a bit lately. Its helping me get back on track! What kind of blender do you use for your smoothies and do you like it? Hi Annie! I love your blog and youtube videos, and take a lot of your advice on cooking, beauty and lifestyle. You've inspired me to start my own blog! Keep up the great work! Muah! i really love your blog and your videos on youtube. they really inspire me and encouge me to have a beatiful life. furthermore, can you show your room to us? Hello! Thought of a question to ask you today!!! How do you organize all your makeup and hair accessories? I live in a one bedroom apartment with a tinyyy bathroom, & I feel like if I had it better organized I wouldn't loose or forget about things.... I would LOVE to see a tour or show us how you organize your cosmetics & hair stuff!!!!!!! Just one question: is the kale and the spinach raw ? you are such a nice girl :) i love your skin so much , is so perfect ! i want to ask if u going to do room tour video ??? Strawberries (frozen) + Banana (frozen) + Guava = heaven!!! looks like some great recipies! !